Edistorm is a virtual extension of one of the most popular inventions in our modern day world…the sticky pad. It is an online format for creating sticky notes for the purpose of group collaboration or just planning a project by posting random thoughts to a board. Most great ideas revolve around simple concepts but the developer of this program has missed the mark on creating functionality with this tool. Initially, I was truly excited about this platform as I am an organized and planning freak but was sadly disappointed to discover that the effort fell short of being fully effective. Further enhancements and cost effective pricing could make this a robust application for use in the classroom. If you’re interested in learning more, listen to my podcast and read below. 2. One person needs to be the group administrator to create the storm and then invite others to join in via email. You will need email addresses for those persons with whom you want to collaborate with so that you can invite them to your particular storm. Note: the website indicates there is an App for the iPad but it’s not there to date. d. An interface that looks eerily similar to Facebook where you can invite your friends and chat. To see an example of this online tool, please click on the link below. Note: you will have to set up a free online account before accessing the group below and you will need to submit your email to me so that I can send you an invitation to join the Edistorm. If you need a place for a group or team to just post ideas on a common wall, then this is a good application. It could be used in a distance education setting or in a face to face meeting. With the online application and an overhead projector, the team could easily discuss different ideas to hone in a project strategy and content. To further enhance ideas and creativity the platform allows users to upload photos onto the board. There is also the ability to add comments by any member of the team onto each photo. A unique and simple innovation allows a easily identified voting pin to show up on each sticky note so that all the members of the team can see which ideas are more popular by team members. The voting is allowed only once by participant. The functionality of adding video to the collaboration board is not intuitive. I tried several times and couldn’t identify how to select the video file to upload. This functionality is a bust! At present the only voting capacity is if you “like” a post it note. Often times, the decision making process involves initially identifying what the team doesn’t like first, then it is a matter of narrowing down the focus to what the team likes for the final product. The decision making process could be greatly enhanced by adding a “don’t like this idea” button. The true measure of any digital database program is how you get the information out of it that was input by the user. As detailed below, the only way to have reporting capabilities is to purchase the upgrade plan. Today’s workflow is based upon transferring information between different software and enabling content manipulation, i.e. research search engines like Mendeley allow you to annotate online resources and then to complete the final product you can transfer those notes into Microsoft Word. Preparing any type of brainstorming or project collaboration would have the same needs so the inability to transfer data out of Edistorm is a problem that limits flexibility and creates more obstacles. The board space is so large that it is cumbersome to keep the content of the sticky notes together where they are easily accessed. 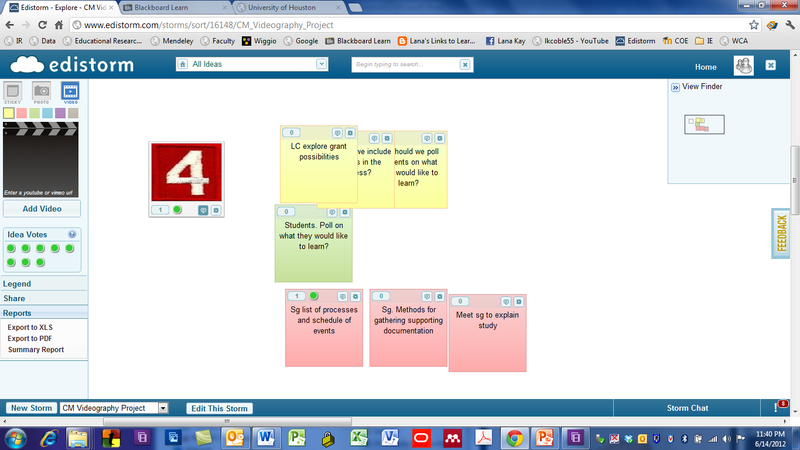 The user has to look at a smaller inset screen in the upper right hand corner to see where the sticky notes are on the board. While it’s not a deal breaker for using the program, it does make maneuvering a little more complicated than it could be. The free version allows 1 storm at a time. This is not practical if you are teaching multiple classes. The second tier version, Educator – Starter is $49 per year and allows 2 storms at a time. Again, this is only effective if you have 2 classes that you want to use this program with. The developer also fails to list what features you get with this plan so when you sign up the user isn’t clear on what features are included. Specifically, the reporting function which would be very important in actually implementing this as a collaboration tool may or may not be available with the upgrade. An educator might feel compelled to use this level or membership but most won’t be willing to invest the money if they don’t know what they are getting from their service level. The third tier version, Educator – Plus is $99 per year and allows 4 storms at a time. In my opinion, for $99 per year the user should be able to create as many storms as they desire. To put this in context, the Adobe Premier Elements program for educators is $110 total and has no limit on usage. Really? While it is understood that the developer has not enlisted outside advertisers to help offset cost, they must have had their heads in the clouds, pun intended, when they thought educators would pay this much money for such limited service. The dashboard has a section which emulates characteristics from Facebook where you can invite your friends to the storms you create or just interact as a social media. So, here is where it gets creepy…upon creating your profile the developer automatically shows up as someone on your dashboard who is following you. Most software programs are designed to allow the developer to track the program’s effectiveness behind the scenes so that they can provide continuous improvement which is acceptable. However, it’s just weird that every time you log into the program to use it you are reminded that this guy is following you. It seems a little too personal to me.